So you need to get elevated to do your work. We carry a wide range of products to help you get the job done. We can take care of your fall protection needs, as well, offer lift training that is WCB and industry recognized. We rent grade 1 ladders, both step, and extension. Our step ladders are 6′ to 12′. Our Extension ladders are 16′ to 32′. We are transitioning to carry exclusively fibreglass ladders, perfect for work near electrical hazards. 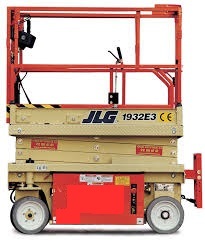 We carry for rent a 30′ JLG electric VML. Comes complete with outriggers. Reach Height from 19′ to 32′ with various deck sizes. All units are rechargeable electric except for our rough terrain which run on gasoline. Extendable decks on most units. All units regularly maintained and serviced. We have rechargeable electric and diesel powered units. Contact us for price, and availability. Due to high demand, we recommend contacting us to schedule your lift as early as possible. Please note that proof of man-lift training that is current and in good standing is required prior to rental. Deliveries will NOT be completed unless the operator can provide this documentation to our driver. You will be charged full delivery price in the event we have to refuse rental due to failure to provide documentation. Contact us to discuss your needs today!